My second teapot of the year is done! I’m (almost) in love with it. 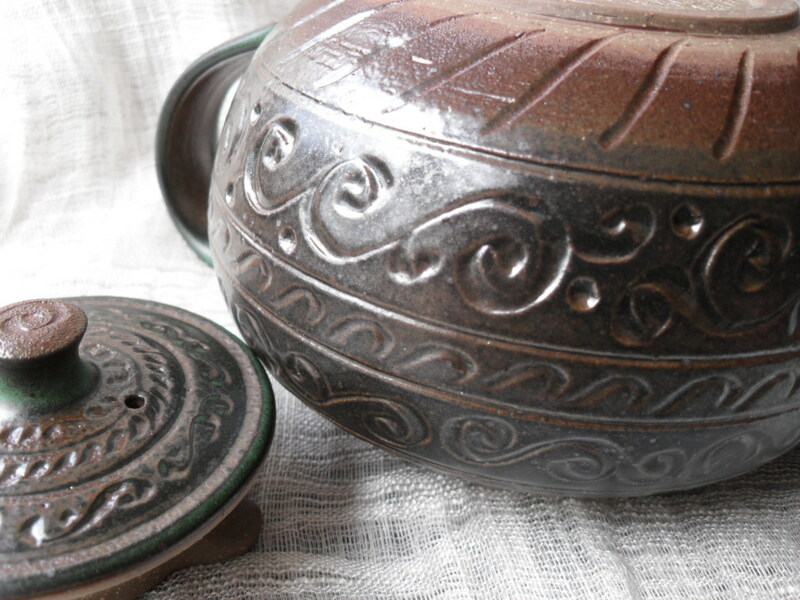 Let me explain–things never come out of the kiln exactly as you pictured them. Sometimes they’re better; sometimes they’re worse; mostly they’re just different. It takes a few days to adjust my mental picture of a specific piece to the actual reality of its finished self, even after I’ve seen it. 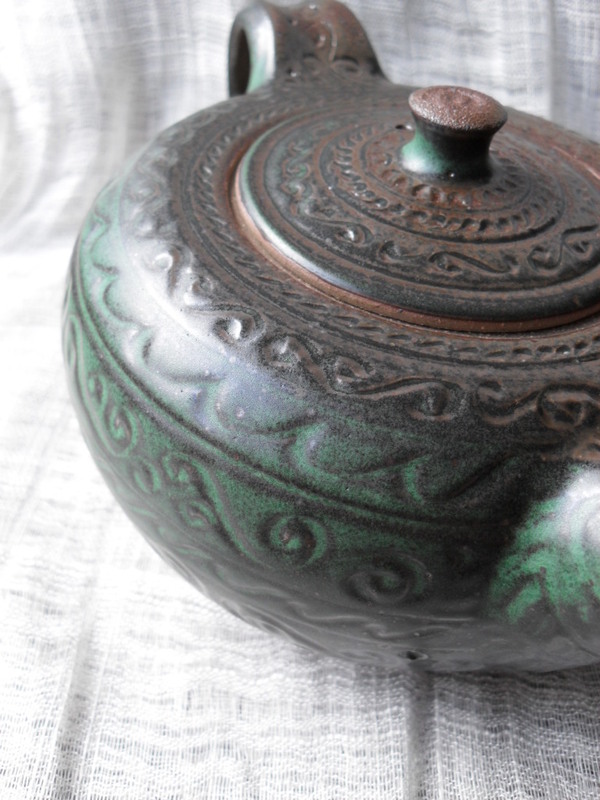 So, yes, I think it’s lovely, even though I had pictured more green [see above], and I got more bronze on one side of the pot and on the lid and handle [see below]. 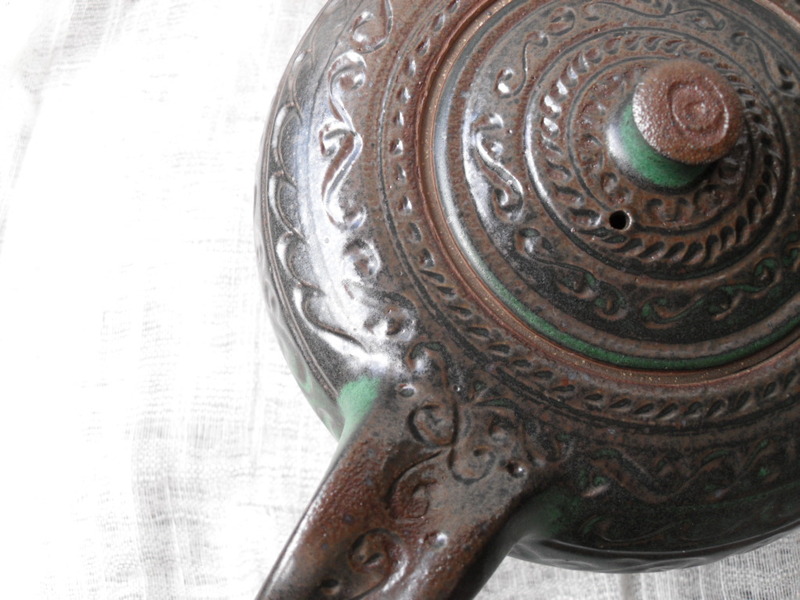 This teapot was glazed by spraying, and I think I may have gone a little thin in places, which is where more bronze happened. This color is definitely beautiful in its own way, almost metallic, and delineates the carving nicely. As far as function goes, this one has a fairly small lid opening, so it’ll be a better teapot for teabags since you can reach in with a couple fingers and nab that little bag out once you’re done–as opposed to loose-leaf (unless you insert a sit-in strainer for easy clean-up). As I’m writing about it, I think I’m finally falling in love. Yes, I adore this pot. You can find its Etsy listing here. 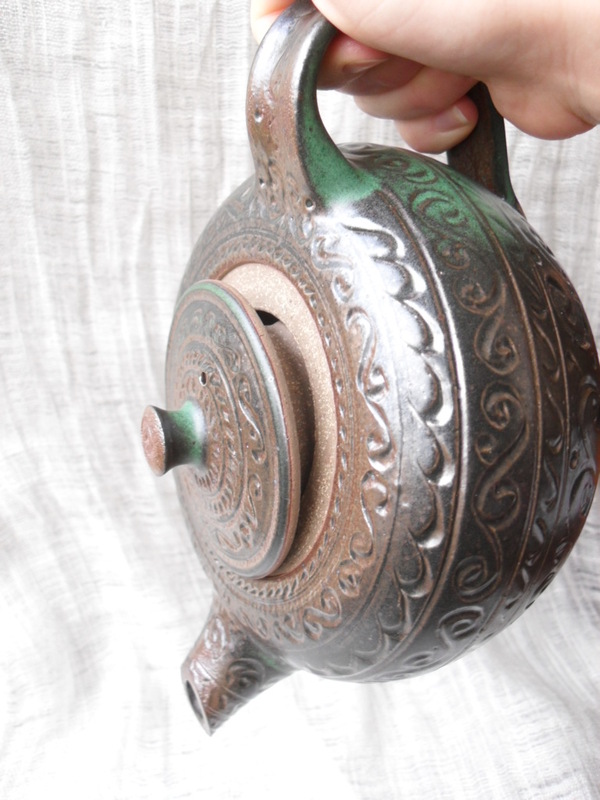 This entry was posted in Pottery and tagged aesthetics, art, beauty, beginning pottery, ceramics, doing what you love, glazes, pottery, spouts, stoneware, tea, teapot, teapot design, teapot making, teapots. Bookmark the permalink.